Chopper Wedding! – Summit Helicopters Pvt. 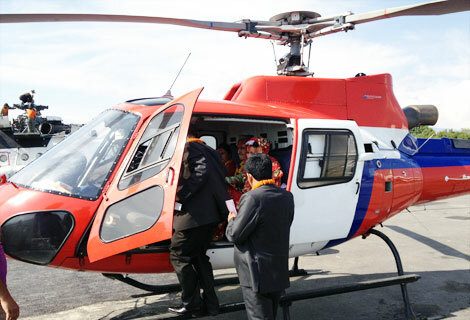 Ltd.
Prakash G.C chartered two of our helicopters from Kathmandu with his newly wed to go visit his Grandmother in Baglung. Prakash G.C. of Baglung wedded Kalpana G.C. from Surkhet . They tied the knot on Friday the 13th. According to their tradition Prakash was to officially introduce his newly wed better half to his grandma who was living in Gwalichour, Baglung whereby proper road travel is not available. 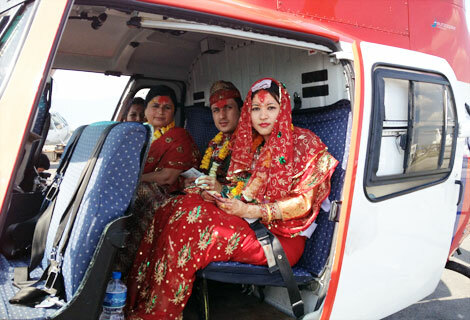 They chose to ride in the helicopter because it would take them much longer by road and also to have a one of a kind wedding. Our helicopters AJI (B3) and AII (B206) were flown by Capt. Ashish and Capt. Mukhiya with the couple and their family to Gwalichour. 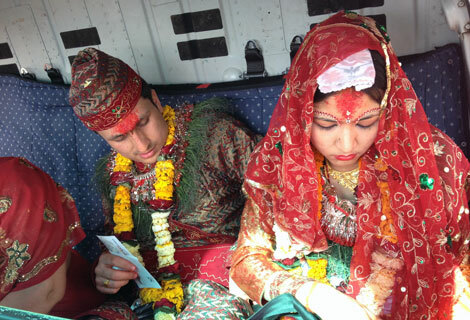 The bridal attire was something new to our helicopter and added delight to everyone’s faces. From Fishtail Air to the G.C. couple Congratulations on your wedding! Let all your dreams come true and every minute be a feast!